Dr. Brian Efird is the program director for Policy and Decision Science. He manages a multidisciplinary, multi-national team of researchers who work on quantitative models of collective decision-making processes (CDMP), geospatial information system applications to energy economics and energy policy, demography and energy, and energy policy studies of countries in the Gulf Cooperation Council (GCC) region. Dr. Efird is co-editor-in-chief of a new journal from Springer Scientific called Energy Transitions. 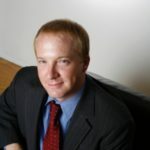 He was previously a senior research fellow at the National Defense University in Washington, D.C.; a consultant on defense and international security matters in Washington; and a consultant applying quantitative models to support corporate, investment banking, and legal negotiations in New York. Provides an empirical evaluation of energy trade flows, focusing on crude oil trade among the top 20 crude oil exporters and top 20 crude oil importers. 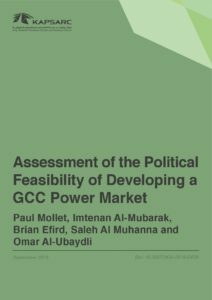 We assess the potential impact of cross-national political disruptions (bilateral and regional) on energy trade between the six producing countries in the GCC and four consuming economies in Northeast Asia. 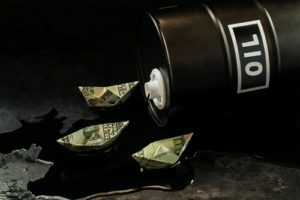 We econometrically measure the impact of political disruptions on total crude oil trade for economies in these two regions to systematically address the question of how much political shocks threaten energy security and the flow of trade. 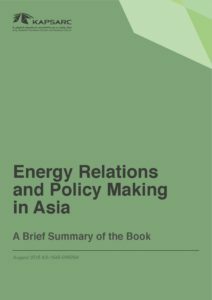 We pay particular attention to how domestic, regional, and international political phenomena and irregular political crises might disrupt energy trade, and under what conditions such disruption might or might not occur. © The Editor(s) (if applicable) and The Author(s) 2016. The United Arab Emirates (UAE) has said it wishes to transition toward a less carbon-intensive energy system, both as part of its Nationally Determined Contribution (NDC) within the United Nations Framework Convention on Climate Change (UNFCCC), and as one of a number of investments in ‘green’ research and development, technology and power generation. 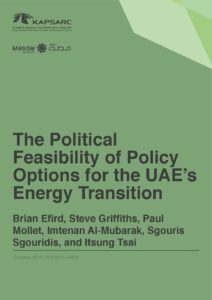 However, given the complexity of the UAE political system, which requires consensus among seven relatively sovereign and independent emirates, as well as commercial and financial interests, it is not immediately clear which policy instruments that might drive the UAE energy transition will prove acceptable and politically plausible. Here, we apply the KAPSARC Toolkit for Behavioral Analysis (KTAB) platform, a model of collective decision-making processes (CDMPs), to assess the political will to agree to and to implement an array of different policy alternatives within the current UAE context. China, the world’s largest emitter of carbon dioxide, is taking steps to combat the effects of climate change on its environment. The path it takes to mitigate the effects of pollution will have a significant impact on the global carbon reduction agenda. In this study, we focus on the political feasibility of implementing a carbon tax in China within the next five years. 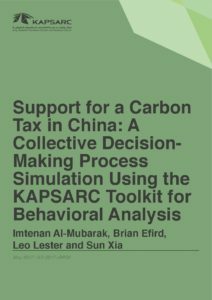 We do this using the KAPSARC Toolkit for Behavioral Analysis (KTAB) platform, a model of collective decision-making processes (CDMPs) developed at KAPSARC to assess the expected support in China for, and reactions to, this potential policy choice. Trade between the economies of the Gulf Cooperation Council (GCC) and North East Asia (NEA) reached $471 billion in 2013, based almost entirely on oil and gas. The GCC sends 44 percent of its exports to NEA, which depends on the GCC region for a very high proportion of its oil imports. Trade relations are otherwise very limited: the GCC takes only 3 percent of NEA’s exports. 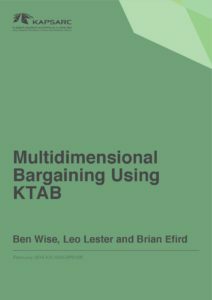 This paper (Multidimensional KTAB) is a technical discussion paper designed as a follow on to An Introduction to the KAPSARC Toolkit for Behavioral Analysis using one-dimensional spatial models (Unidimensional KTAB). 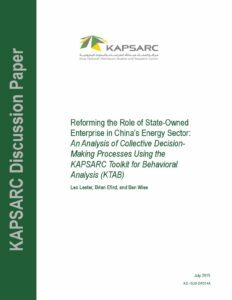 It extends the original framework of KTAB to explain the analysis described in the recently released KAPSARC discussion paper Reforming the Role of State-Owned Enterprise in China’s Energy Sector: An Analysis of Collective DecisionMaking Processes Using the KAPSARC Toolkit for Behavioral Analysis (Chinese SOE Reform). 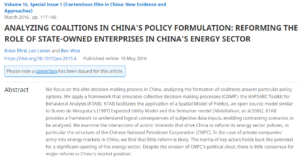 What are the prospects for reform of the Chinese energy sector? This question is the subject of much debate both inside and outside China. Since coming to power in November 2012, China’s new government has issued a series of statements on reform, clearly an important part of the country’s continuing ‘great revival’. Despite this, some experts have been unconvinced by the pace of economic reform. What reform means for the energy sector is even less clear. There are competing views on how, and to what extent, the energy sector and energy policy will be reformed, but they all share various potential biases resulting from incomplete data and “not knowing what we don’t know”. 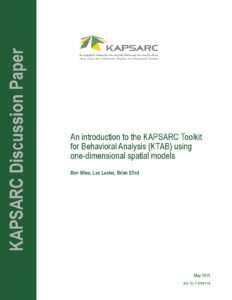 The KAPSARC Toolkit for Behavioral Analysis (KTAB) is freely available, state-of-the-art software that has been designed to enable the rigorous and systematic analysis of collective decision-making processes (CDMPs). KTAB is being designed with three types of users in mind. The program code is available directly for computer programmers. Power users will be able to construct their own specific models based on the existing structure, and applied users will be able to access pre-built models through a simple graphical user interface. 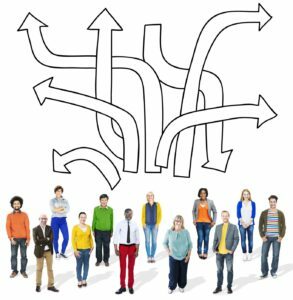 Collective decision-making processes are those in which a group of individual actors interact to arrive at a single decision. Common examples include the deliberations of corporate boards. These processes have usually been studied in a purely qualitative fashion, but there is a growing body of evidence which suggests that computer models can deliver additional insights. KTAB is being designed to unlock these additional insights for a broader range of analysts, but its release is also hoped to extend the awareness of computer models as a route to the investigation of CDMPs, and to prompt a wider acceptance and uptake of a quantitative approach to such analyses. Government policy is a critical factor in the understanding of energy markets. Governments create constraints and incentives that drive behavior through policy. In turn, these behaviors have fundamental impacts on the functioning of markets. Despite the critical role of policy, it is rarely approached systematically from a research perspective. One of the first and most basic steps in a systematic approach is gaining a precise understanding of what policies exist, their intended outcomes, their geographical extent, duration, and expected evolution. A systematic understanding of policy, with this level of detail, would enable the research community to answer a variety of questions that, for now, are either over-simplified or ignored. Policy, on its surface, is also a very unstructured and qualitative undertaking. There may be quantitative components, but policies are usually framed in sentences requiring interpretation of their meaning. This makes it difficult to incorporate an understanding of policy into quantitative approaches, other than by making assumptions as to the effect of policy in framing a quantitative model. 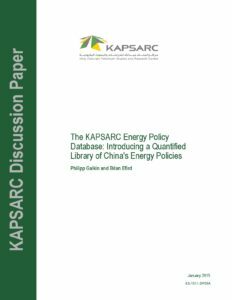 The KAPSARC Energy Policy Database (KEPD) is intended to address these two energy policy research limitations. 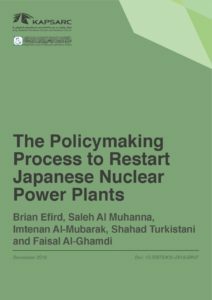 The methodology described in this paper could be applied to any set of energy policies, though this becomes a large task very quickly. The traditional economic approach to policy analysis is to utilize tools and methods developed within the field of economics and study the economic impact of one or more policies solely from an economic perspective. As a consequence, the “policies” are usually formulated and evaluated only by an assessment of the pure economic optimality of expected outcomes. 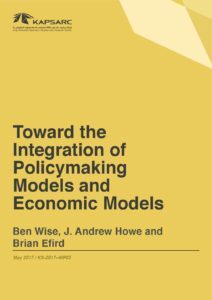 Moreover, economic models typically treat policy choices as exogenously specified. Once policies are selected according to some exogenous process, then scenario analysis can be performed to simulate the economic impact of those policies.